The automobile excels as a container for carrying people and possessions door-to-door. If cars could be loaded rapidly onto mass carriers, public transport would have the same convenience. When passenger traffic is containerized it can be integrated with freight, improving the efficiency of both. Europe is putting too much faith in high-speed rail as the alternative to driving and flying. Long journeys usually require all of them. In a transport mix, the main source of inefficiency is not low speed but the messy transfer of passengers between modes. Travel to and from airports depends on other vehicles. As roads become congested, total journeys last longer, even if one leg of them is fast. Even for shorter journeys, rail is not the whole solution. High-speed trains cease to be economical if they stop frequently. Like airline passengers, train users will have to travel great distances to begin their rides. Moreover, although Spain, France, the UK, Italy and Germany have thousands of kilometres of track designed for speeds above 200 km/h, most EU countries have little or none. A high-speed rail network spanning Europe is a distant and very expensive scenario. For the foreseeable future, much travel will remain intermodal, requiring transfers between different vehicles. Today intermodal transfers are slow, unpleasant and sometimes chaotic, especially for people with luggage, children or special needs. Hence the preference for automobiles. Cars carry passengers and possessions door to door with privacy, personalisation and protection. The trip may be long, but the time is spent in a single container, insulated from the weather and unpredictable travel companions. The cheapest, fastest way to improve travel comfort and reduce total journey times is to bring organisation and efficiency to transfers. In the 1960s and 1970s, Personal Rapid Transit was seen as a way of giving public transport the advantages of the car. PRT vehicles were to be publicly owned buggies running on special tracks. Some variants were high-speed, some were driverless. In any case they have not spread beyond test environments and airports. This is not merely because of the cost. The private car is one of the few major capital investments that individuals are happy about – in some cases, ecstatic. It is an expression of taste, individuality and empowerment. Most PRT prototypes, on the other hand, were no more stylish than bumper cars. PRT would have shifted this investment to public authorities, probably to be paid at least partly in taxes, for which there is less general enthusiasm. At a time when European governments are trying to control public spending, PRT is a non-starter. Although some political parties have a strong antipathy towards private cars, most see it as unrealistic to pursue a medium-term transport policy that differs so radically from the status quo. This is not to say that the current automobile paradigm has no room for improvement. For high-speed road travel, cars need stability and low air resistance, so they have long, low bodies with powerful engines and collision protection. These heavy, expensive, fuel-hungry features would be unnecessary if privately owned cars were carried economically inside public vehicles for the high-speed, long-distance leg of the journey. Public transport would get privacy, personalisation and protection. The most fuel-efficient mass carrier for cars is the train, promoted as the Autotrain in the US, Motorail in Britain, Autozug in Germany and Austria, Autovlak in Slovakia, etc. In addition to its low emissions, it is capable of carrying cars at great speeds. The technology dates from the Second World War, when military vehicles and tanks were transported by rail. Rather than motorail, it is better described as piggyback transport (German Huckepack, French kangourou), one vehicle loaded onto another. Affirmation of Car Trains in the European Union, published in Promet, the Scientific Journal of Traffic and Transportation Technology in 2008, is possibly one of the least prophetic articles ever written. Seven years later, even Germany, the “driving force of progress”, is trying to close down or sell off its piggyback rail operations. 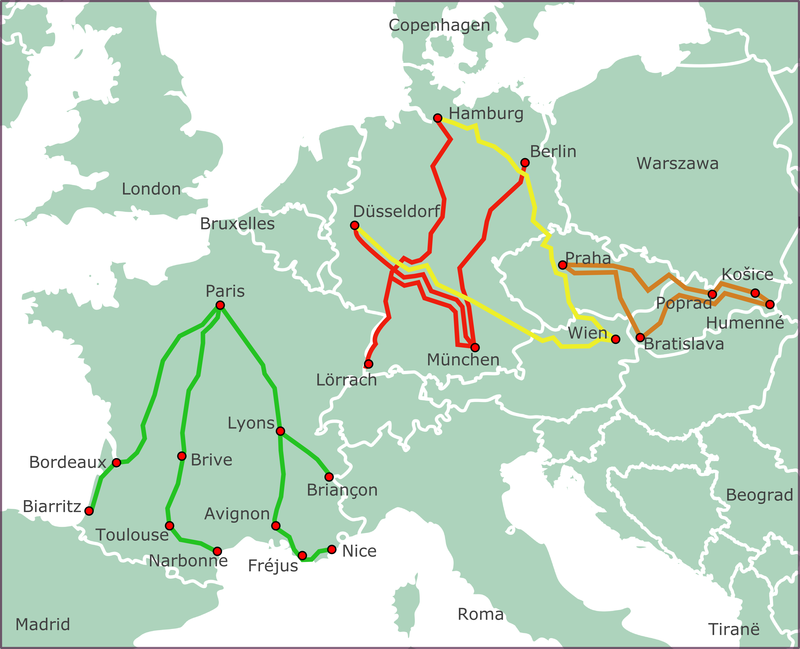 French, German, Austrian, Czech and Slovak car carrier routes, 2014. Commercial losses have already forced the closure of motorail in Britain, Italy, Iberia and the Balkans , and there is only one Autotrain in North America, carrying cars not east to west but from Virginia to Florida and stopping at stations served by no other trains. Patently there is something wrong with the idea. Or is it the technology that has not kept pace with improvements in motor vehicles? It has hardly changed since World War II. Cars are loaded from the end of the railway carriage, which can only be done by uncoupling it. And they are usually carried on two levels, which achieves density but requires special station structures. These are drastic limitations on the viability of piggyback services. They are almost all point A to point B; you cannot pick up and put down at stations along the way if carriages have to be uncoupled every time. Loading and unloading require a minimum 45 minutes each, and to unload an intermediate car, all those in front or behind it must be moved. Consequently, motorail operations are long-distance and usually overnight. This in turn means that the driver and passengers need accommodation in a separate carriage elsewhere on the train – or even on a different train. Instead of being the ecological, economical alternative, motorail is expensive. Users everywhere have voted with their feet, or rather, their cars. Imagine instead, a carriage loaded quickly from the side, carrying cars over distances short enough for passengers to remain in their cars for the duration of the rail journey. The car becomes a dual-mode passenger container. The service becomes cheap. Piggybacking can relieve the pressure on congested roads. A double-track rail line parallel to a motorway is a cheap, space-saving alternative to road widening or double-decking. 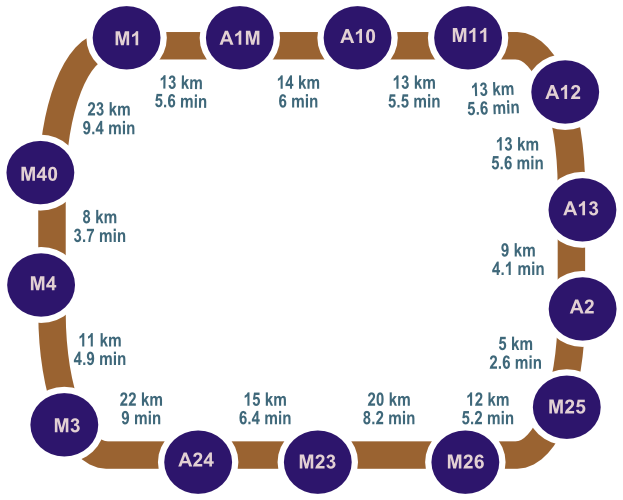 Stopping at the 14 marked intersections, a train (acceleration & braking 1 m/s², peak speed 160 km/h) would orbit London’s M25 in 91 minutes, an average of 126 km/h. On orbital highways, trains could rotate in each direction, with stops at major intersections. Such is the volume of traffic on roads like London’s M25 that services would be viable even if used by only a small proportion of vehicles. As the take-up rate increases, a booking system could assign cars with the same destination to the same train. New stations can then be opened at closer intervals without reducing average speed, because trains will not stop at every one. Services can gradually be extended to more distant destinations, with network effects as routes are combined. For satellite communities, from which many drivers set out daily for roughly the same destination, piggybacking would be better and cheaper than conventional driving and public transport. Such trains can promote the development of marginal land like islands and hillsides. They can create residential areas on sites not easily linked to the road network because of intervening natural obstacles or conservation areas. The company that constructs the new community, or owns the land developed, is the logical builder of the track. Land that is marginal because it was once used by industry or a port often has a railway line already, or at least a vacant corridor formerly used by a rail track. Piggybacking also improves the viability of tunnelling, because rail tunnels are cheaper to construct and operate than road tunnels. Aircraft will continue to be the only way of travelling over long distances and oceans, but piggybacking can expand the radius where cars are viable. It offers greater comfort and creates lower emissions without significantly greater travel times. Trains can carry city dwellers part of the way to weekend homes in the countryside, even if their cars are electrically powered and therefore have limited road range. Suitably equipped for long distance travel, a non-stop train can cover 900-1200 km in six hours without special high-speed track. Holidaymakers from Sweden or Finland could be transported to ski resorts in Lapland or, overnight, to the Mediterranean coast. Germans could go by car to Italy. A rail journey from Berlin to Venice currently takes 16 hours because it involves two changes of train and more than 30 stops. On some routes, track improvements will be needed for rapid, uninterrupted train services. The cost of facilitating traffic will be lower when new routes are being built. It is true that piggyback tourism has the potential to create road congestion, although many air passengers already pick up a hire car at the airport. But for most travellers, the car will simply be a way of moving people and possessions to a vacation venue in one convenient container. If good public transport is available at the destination, the extra demand created by the containers will mainly be for parking space. Piggyback train profitability will not rely on passenger transport alone. Inefficient transhipment between rail and road has been a major obstacle to dual-mode freight. The obstacle disappears when transhipment becomes fast and easy. The same train carriages can carry freight vehicles and cars, creating more frequent and cheaper services for both. Consequently much of the freight that is currently delivered by road will shift to trains for the long-distance segment of its journey. Piggybacking will not only create savings for the national economy; it will also remove heavy vehicles from the roads. Freight applications point to the usefulness of autonomous driving systems as part of the specifications for piggybackable cars, to handle loading and unloading. Vans would thus be able to travel in the rail carrier without a driver, improving productivity. But although piggybacking and autonomous driving both allow drivers to read, work or sleep as the miles roll by, the systems are different in other respects. The self-driving cars currently being developed are for road use only, with the greater power, weight and streamlining that it entails. Cars designed with piggybacking in mind can be lighter. Piggybacking cannot replace the metro, light rail and commuter rail systems of major cities, which achieve high passenger densities. Urban and intercity highways, on the other hand, have lower densities and high costs that piggybacking can beat. Taxis coexist well with rail carriers. A driver is not essential for the rail leg of the journey so, providing the rail fares are low, long taxi journeys will become economical. Long-distance buses, suitably adapted, can also be carried by rail, although stations will probably be built where land is cheap, outside conurbations, rather than in the city centres and residential areas served by current bus routes. An alternative to buses, coaches and delivery vans is a booking system, to put drivers with spare seats in touch with passengers or freight consignors. Designed for low road speeds, cars for piggybacking will have low weight and thus low running costs and long intervals between refuelling or recharging. Electricity is ideal for a short-range vehicle that can be recharged on the train. If it is to be unsubsidized and voluntary, piggybacking will demand tougher price competition between rail and road transport. When all factors are costed, travel by piggyback train will have to be cheaper than driving to the same destination.